- After a pair of wins over Bemidji State, the Friars look to keep things going as Hockey East play beings Friday night at Schneider Arena against Holy Cross. The Crusaders look to get their first win of the season as they sit at 0-1-2 on the year. - Providence stormed back from a 3-0 deficit on Saturday to sweep the Beavers. Maureen Murphy (Buffalo, N.Y.) had a four-point (3g, 1a) weekend, including two unassisted strikes. 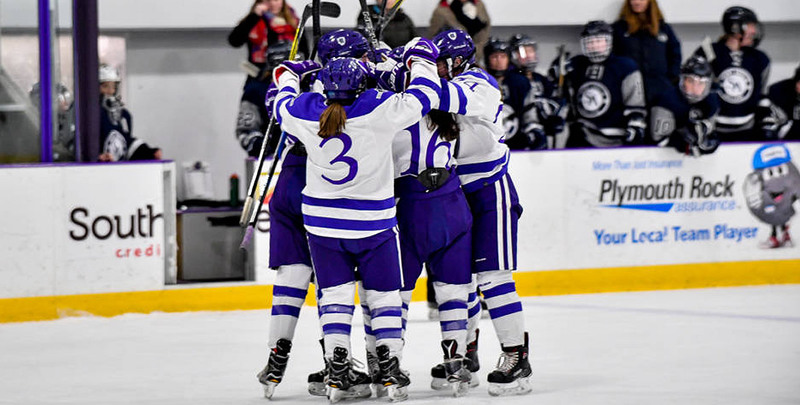 - Holy Cross officially begins its tenure in Women’s Hockey East Friday night, taking on the Friars in the first-ever conference game for the Crusaders. It marks game four of a six-game road trip to start the year for Holy Cross, its first season in Division I play. - UConn has yet to drop a decision in 2018-19 so far, winning a pair of one-goal games against St. Cloud during the opening weekend and topping Vermont, 4-2, as the Huskies and Catamounts opened league play on Oct. 6. - The Huskies and Raiders played three times last season, including a clash in the 2018 National Quarterfinals. Colgate took all three results, allowing just three goals across the trio of tilts. - After a collecting three league points with a 1-0-1 record at Boston University last weekend, #9 Northeastern hosts #7 Colgate at home this Friday and Saturday. - Aerin Frankel’s (Briarcliff Manor, N.Y.) 28-save shut out on Friday gave the Huskies a 5-0 win. The Terriers owned the nation’s longest scoring streak, as they avoided a shutout in each of their last 74 games dating back to the 2016 WHEA championship game. - #6 Boston College begins its weekend series against St. Lawrence Thursday night in the Conte Forum. The program split a series at St. Lawrence last Nov. 10-11. - The pair of tilts with the Saints will be the Eagles’ final non-conference games until Feb. 5 against Harvard, a span of 23 games. - Rookie goaltender Maddy McArthur (St. Catherine’s, Ont.) earned her first career win with 22 stops, including 11 in the third period, against Syracuse on Saturday. - Merrimack looks to stay undefeated and notch its fourth win of the season on Friday as they host BU for its first league game of 2017-18. - The Terriers seek a bounce-back win after an 0-1-1 mark against Northeastern last weekend. Last season, Boston University took a 2-1-0 record over the Warriors. The 2-1 Warriors win came on Sept. 23, 2017, just six days before Merrimack toppled then-#3 Minnesota on the road, 4-3. - After the team travels to Merrimack on Friday night, it’s back to Boston on Saturday for the Terriers as they get ready to host New Hampshire. The Terriers were undefeated against the Wildcats in 2017-18, going 2-0-1. - UConn travels to UNH Friday night looking to improve its record to a perfect 4-0-0 overall (1-0-0 WHEA). - The Wildcats are still in search of their first win of the season, after going 0-1-1 at #10 St, Lawrence last week feeding off of 65 saves from sophomore netminder Ava Boutilier (Charlottetown, P.E.I.). All three UNH games this year, including an exhibition contest, have gone to overtime and New Hampshire has allowed just two goals across those three outings. - After two wins at Quinnipiac last weekend, Maine looks to get two more as they host Sacred Heart this Friday and Saturday for backto- back matinées. - Riding three goals and an assist from Tereza Vanisova (Strakonice, Czech Republic), the Black Bears started off 2-0-0 against the Bobcats. Vanisova clinched Friday’s game with the overtime goal and was honored as Hockey East Player of the Week. - Last weekend, Vermont dropped its season- and home-opener, 4-2, UConn. Catamount rookie Lilly Holmes (Saratoga Springs, N.Y.) netted her first career goal in that outing, converting on a short-handed opportunity. - Senior goaltender Melissa Black (Newmarket, Ont.) stopped 32 shots, including 13 against the UConn power play, in the opener.